The City Centre  is where Governor Philip first raised the British Flag on Australian soil in January 1788, and is the earliest site of European settlement in Australia. Two hundred and twenty years later, it is now a Manhattan-like skyline of skyscrapers on the harbour. It is the commercial centre of Sydney seeing hundreds of thousands of Sydneysiders commute daily, to work, shop, and socialise. The city centre meets and embraces its harbour. The entire foreshore is walkway, and much of it is parkland. The office towers compete with each other for the best view of the harbour, with those in the back row grateful for any glimpse. 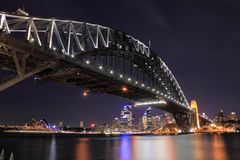 It is the site of Sydney's grandest structures, from the modern Opera House and Sydney Tower, to the art-deco, the granite facades of the early 20th century, and the colonial sandstone of a convict era. The oldest buildings may be in The Rocks, but those warehouses and residences lack the proportion, scale, and inspiration of the construction in the city centre. Into the evening, there is a stark contrast as many of the crowded footpaths in the business-centred streets grow quiet, and many of the city eateries and cafes in these areas wind down. There are still many people around though: the after-work crowd is still around in the city pubs, the opera aficionados and diners are out down at East Circular Quay, and the groups meeting up near Town Hall for a movie, a drink, or a night out. Most of the after-hours nightlife is centred around George Street and Liverpool Street near Town Hall and World Square, as well as Chinatown where 24 hour and late night eateries, venues, shops and entertainment options are more common. The City Centre lies at the hub of Sydney's transport network. Most major roads, and public transport radiate from the city. Catch a train from anywhere and it will stop here. The City Circle is a two way train loop of five stations. Town Hall. Centrally located. Best for shopping, Pitt St Mall, Queen Victoria Building, Sydney Tower. There is also a station at Martin Place, the CBD area which is fairly close to Town Hall station. This will be the more convenient station if you're coming from Bondi Junction, if you intend to see the city central. Avoid getting off at Central, in the City South for the City Centre, it is really only Central as far as the train network is concerned. Train tickets to Central cover the City Circle stations, thus it is recommended to travel to other stations. When buying a ticket, you can just press the City button on the ticket machines, or ask for a ticket to the City at any ticket window. You can get off at any city stations above. If you are travelling from the North Shore to Wynyard, get a ticket to Wynyard which will often be cheaper. Direct buses to the city centre are available from many inner suburbs, and some outer regions. Sydney provides a free bus shuttle (route 555) around the CBD from 9:30AM to 3:30PM weekdays (or to 9PM Thursdays and 9:30AM-6PM on weekends  connecting Central Station in the City South and the City Centre. It stops at Central (from stand B at the west side of the station), and travels along George Street via Haymarket (to Chinatown in City South), near Goulburn Street (for Town Hall station), in front of QVB, near King Street (10-15 walk to Darling Harbour), then along Bridge Street to Circular Quay on the north side of the City. If you are travelling from the CBD by bus on a weekday from 7AM until 7PM, you have to purchase a ticket before you get on the bus. Routes may indicate "Prepay Only" on the electronic screen at the front of the buses depending on the time, while some routes are "Prepay only" at all times. Tickets can be purchased though from hundreds of shops around the city, usually available from convenience stores, newsagents and supermarkets. The most pleasant way to arrive in Sydney city or to get out and see the harbour or north shore, is by ferry . Most Sydney Ferry routes (from 41 wharves around the harbour suburbs) start or finish at Circular Quay, at the northern end of the CBD. Take a ferry to Manly, Watsons Bay in the East, or Parramatta in the west, all for far cheaper than taking a tour. There is a train station and major bus terminus for connections to other parts of the city. The city is accessible to private vehicles. It is well signposted from most surrounding areas. Firstly as Sydney, then as City, and finally, as City North or City Centre. Don't confuse City North, with North Sydney, or you will end up on the other side of the harbour. Traffic in the city can be congested. Peak hours, Friday lunchtime, and Friday afternoon are worst. Weekends are usually fine, although some congestion can occur at any time. Traversing the few city blocks can take up to 30 minutes during these periods. Garage Parking can vary from around $18 to over $70 for a day on a weekday. Doing a little research and arriving and leaving at the right times can save you over $50 on a weekday. Don't be misled by parking stations advertising parking for $5, as this usually apply for the first 30 minutes, after which charges rise steeply. Early-bird rates (for arriving and leaving during set times) can save up to 75% on hourly rates during the day. Parking stations usually charge less for evening parking and all-day weekend parking. A flat rate is often available for $15 or less, but not all places have special deals, so check before you park. It is a safe bet to drive around the CBD and check the flat rates advertised outside the parking stations on weekends. Opera House Car Park, at the end of Macquarie St, $14 on weekdays entering before 10AM, and exit after 3PM and before 7:30PM. ($42 otherwise for day parking, or $32 if you enter after 5PM). $15 on weekends, provided you exit before 5PM. Queen Victoria Building Car Park, $27 enter before 9:30AM, exit after 4PM and before 7:30PM. $50 all day otherwise. $15 Sunday parking. Street Parking is scarce and although street parking for short periods is possible it is often difficult to find, particularly during the day on weekdays. Free on-street parking or street parking available for extended periods is particularly elusive. Early on weekend mornings, some on-street parking is usually available in Clarence, Kent, or Sussex Streets. On street parking is also available on Art-Gallery road. Expect to pay. Some free on-street weekend parking is available where no parking zones apply on weekdays. All public parking zones are enforced by city parking police and occasionally state police, infringement penalties are expensive. One of quietest approach to the city is from the west at Darling Harbour and Pyrmont. The Pyrmont Bridge allows cyclists, and a cycle path takes you along to King St as far as Clarence St. There is bike parking there. From the North take the cycleway over the Harbour Bridge, next to the station at Milsons Point. Maps and other information for cyclists around the inner city are provided by the local government. .
Bridge St is one of the major east-west roads in the city centre, running just behind Circular Quay. It goes nowhere near the Harbour Bridge. The road is one of the earliest in the colony of New South Wales, and the site of the first government house, very near the first settlement. It was also the site of the first bridge built in Sydney, over the Tank Stream, which was Sydney's first water supply. The Tank Stream has long since been buried and become an underground drain. The name Bridge St remains. The city has a very rough grid system, with George St being the major city street running all the way from Central Station in the south to Circular Quay and The Rocks in the north, with Pitt and Castlereagh St running parallel through the city centre. City blocks are small. There are maps and directional signs to nearly attractions located every few blocks. Most of the attractions below are within a 1.5 km radius, and are easy to walk around. There are few cycleways around the city, and you can be fined for using the footpaths and pedestrian malls. Travelling North-South along Kent St in the west or College St to the east is easy enough, but going east-west through the city requires capability and determination. It may be best to leave your bike on the city centre fringe, and walk while downtown. There are bike parking spots all over the city, and you can park your bike pretty much on any street. If you leave your bike unattended then ensure you park it in an area with high visibility - like outside Clarence St Cyclery - and secure it well. All are numbered on their indicator boards at the front and on the left side of the bus, and show the final bus destination. The major bus interchanges in the City are at Circular Quay, Wynyard, Town Hall and the Queen Victoria Building. Buses from Wynyard run straight over the Harbour Bridge. From Circular Quay, as a general rule of thumb: Any bus number starting with "3" run the eastern route (i.e. to/from Circular Quay via Elizabeth Street and to/from the Eastern Suburbs), while the ones starting with a "4" run the western route (ie. to/from Circular Quay via George Street and to/from the Inner West). The ones starting with a "5" run along George St between Circular Quay and Town Hall before heading over the Anzac Bridge. As the buses run along George St between Circular Quay and Town Hall they only stop at each alternate stop. Check the bus stop signage, and walk to the next stop if your bus doesn't stop there. Buses running along Clarence St and York St between Wynyard and Town Hall generally don't stop between those two points. Join southbound buses at Wynyard interchange, or northbound at the QVB. The southbound buses along Clarence St don't operate via the Wynyard interchange, but have stops scattered along Clarence St. Each bus that passes along Clarence St stop at least once at one of the stops between King St and Margaret St. Check the signage at the stops. At the interchanges (Circular Quay, Wynyard, Town Hall and the QVB) have multiple stops, each assigned a letter. See the guide at the stops. City Sightseeing Sydney Explorer bus tours. Costs more and takes longer than normal public transport, but can take the hassle out of planning your routes. Trains run both ways around the city circle stations Central, Town Hall, Wynyard, Circular Quay, St James and Museum. Each of these stations has services every five minutes. Most of the city is no more than ten or fifteen minutes walk from a train station. Another city station, Martin Place, is mid-town on the Eastern Suburbs and Illawarra line and has services every 10 min to Town Hall and Central. Town Hall, Wynyard, Martin Place and St James stations are located within 1km of each other, so unless you are feeling particularly energetic, catching the train or bus between them will take longer than the walk. It is unusual to drive between city centre attractions, and it can be problematic if you are unfamiliar with the area. Attractions in the city are not signposted from the city roads. The only directional signs you will see will point you out of the city, across the harbour bridge or to the west or east. There is a one way system and few right hand turns are permitted. Some right hand turns are legally possible, but are difficult to find breaks in traffic. The quickest route from where you are to your city destination will not always be apparent from a map, and even the best GPS will struggle in the canyons of the city. If you are driving into the city, best to navigate straight to a parking lot nearby. If you are going between multiple desinations in the city, walking is usually the quickest way. If you are driving around then out of the city best to rent a car from one of the car rental operators located downtown. 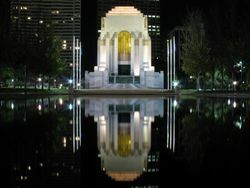 Sydney City is home to a large number of outstanding examples of Art Deco architecture, built during the 1920s and 1930s, when Sydney entered a new phase of confidence and investment in urban infrastructure. Harbour Cruises depart from Darling Harbour and at Circular Quay in the city. Sydney Opera House  ☎+61 2 9250 7111 . The Sydney Opera House is one of the most iconic 20th century buildings in the world. Inaugurated in 1973, the Sydney Opera House also has dedicated theatres for drama including the Drama Theatre, the Playhouse, and The Studio. Student rush tickets are often available for the current day's performances, only at the box office at the Opera House (usually these are single tickets, spread around the theatre). State Theatre, 49 Market Street between Pitt St and George St., ☎+61 2 9373 6852 (fax +61 2 9373 6537). Hosts a range of events and performances, particularly international comedy acts and musicians. The building itself is heritage-listed, and has a lavish interior dating back to 1929. Other theatres are at Lyric Theate at Star City in Pyrmont, the Capitol Theatre in the south of the city, and the Wharf Theatres at Walsh Bay in Sydney/The Rocks. If you are interested in fringe or arthouse films, you may also like the Chauvel, Verona and Academy Twin cinemas in nearby Oxford Street. The CBD of Sydney is also the retail centre of the city, having the largest range of shops and outlets in a variety of settings. Sydney's shopping is frequently concentrated within large city malls and arcades (heavily interconnected mid-town through a number of underground walkways). There are also a number of recognised shopping strips. There are both premium and budget areas. If you are shopping for supplies, the convenience stores, and even the city fruit stores can have up to three times mark-up over supermarkets. If you need to stock up on the basics, try Woolworths opposite Town Hall on George St or underground north of Wynyard Station, or Coles above Wynyard Station, or on the corner of King and George. David Jones, 86-108 Castlereagh Street, ☎+61 2 9266 5544, (fax +61 2 9267 7326). The city stores of this illustrious department store are on Elizabeth Street (main store, women's fashion) and Market Street (men's fashion, homewares). In operation since 1838, David Jones is not only Australia's oldest department store, but also the oldest department store anywhere in the world still trading under its original name. Castlereagh Street North from Market St and Martin Place between Castlereagh and George Sts. Home to a large concentration of fashion houses and big names including DKNY, Louis Vuitton, Cartier, Ferragamo, Gucci, Bvlgari, Stefano Canturi and Chanel. There is much competition, many specials, and choices for breakfast and lunchtime eating. Even the classiest restaurants tend to have lunchtime specials, and the competition for breakfast, coffee and lunch at the budget end of the market is fierce. At dinner time many of the cafes and take-aways have closed in the CBD, and the remaining restaurants can be expensive. Doing your food exploration at lunchtime will save you money in the city centre. Neighbouring Chinatown in the south of the city has large number of restaurants offering cheap and tasty Asian cuisine, and the food courts in Market City stay open into the evening, when the CBD ones have usually shut. Many places in Chinatown serve food later than most restaurant kitchens close, it is an area very popular with people who consider themselves 'night owls' and like to eat late. Westfield in Pitt St Mall, also open weekends and Thursday nights. Under the Westpac Building in Wynyard (between Kent St and Sussex St, by Margaret), courtyard with a nice aspect. In the Metcentre at Wynyard (George St, near the corner of Margaret). Hunter Arcade specialises in SE Asian food. Delicious Thai for $6. (Hunter St, or go down the steps at Wynyard Station and continue on). Opens Mon-Fri 11am-3pm only. Prices reduces to around $5 after 2pm. MLC Centre in Martin Place, corner of Castlereagh. Prices reduce after lunch. If you fancy an early dinner (or late lunch) many of the food halls sell off remaining lunch items at discounted prices around 4PM in the afternoon, sometimes for as little as $4-$5 a meal, but commonly for $6. The CBD is flooded with cafes and pubs doing lunch with mains in the $10-$15 range. Avoid the ones in or immediately next to major tourist attractions to avoid inflated prices. Clarence St, York St, and even Pitt St have many to choose from. Outside of the cafe scene, mid-range restaurants in Sydney's CBD proper tend to be a little thin on the ground, but you will find plenty clustered around the George St cinemas and World Square, and on Liverpool St.
Sydney's top-end dining scene is world class, with prices to match. Some of the best restaurants in Australia are listed below, and many of them feature on the San Pellegrino list of the Top 100 restaurants in the world. Summit Restaurant, Level 47, Australia Square, 264 George St., ☎+61 2 9247 9777, (fax +61 2 9251 2539). This revolving restaurant has excellent views of the city from the harbor to south Sydney and completes a rotation every two hours. If you want to take a look at the view, but don't feel like paying for a meal, you can just go to the bar for a drink, and come back down again. Drinks are pricey too, though. Bridge Bar, Level 10, Opera Quays 2 East Circular Quay, ☎+61 2 9252 6800. Awarded the title of Australia's Cocktail Bar of the Year, by bartender magazine, the Bridge Bar is a tranquil and elegant venue suspended between the tenth floors of two of Sydney's most desirable apartment blocks at East Circular Quay. Fantastic views over Sydney Cove and Circular Quay to the Opera House and the Bridge - a real treat at sunset. Fantastic cocktail list (189 varieties), friendly staff, vibey lounge music and good bar food. Orbit Bar, Level 47, Australia Square, 264 George Street. 5PM-Midnight. Spectaular views over Sydney from this revolving bar at the top of the 1970s iconic Australia Square office tower, a stylish makeover of the old Summit Restaurant. Designer cocktails while the entire level revolves slowly over 90 minutes. Floor to ceiling windows means that you can gaze from your Kubrick-2001-inspired seating and decor to the city below. Consistently highly reviewed. Cocktails average $15 a glass. Sydney has recently relaxed its licencing legislation, leading to a few experimental style small bars. Time will tell if they succeed against the Sydney beer halls. Try the Shirt Bar in Sussex Lane (off Kent St just south of Erskine) to have nice wine, beer, coffee and cake amongst antique sewing machines, or in Wynyard Lane, just outside the entrance to Wynyard station, where you can have a Lord Nelson Brew or a Margaret River Sav Blanc on a recycled milk crate next to the garbage bins in the back lane. 3 Wise Monkeys Pub, 555 George Street, ☎+61 2 9283 5855 . The 3 Wise Monkeys is a very popular pub with a younger crowd, only a block south of Town Hall station in the cinema district. It has live music seven nights a week. Soup Plus, 1 Margaret Street, ☎+61 2 9299 7728 . Soup Plus is Australia's longest running jazz venue. Entry is $5 M-Th nights, $8 M-Th nights for big bands and special presentations, and $30 Fri and Saturday nights. The weekend charge includes a two course meal. Metro Theatre, 624 George Street, ☎+61 2 9550 3666 (box office). The metro, in the cinema district near Town Hall, is a live music venue for Australian and overseas acts. Usually standing room only, and active mosh pit at the front, with a active vibe. The Drum Media  is a free, weekly music publication. You can find a copy at most music stores around the city and the inner suburbs. Metro is the Sydney Morning Herald's entertainment lift-out, published every Friday. There is little budget accommodation in this district. There are some backpacker hostels but generally cheaper accommodation is found in the surrounding areas around Central Station in the City South. Menzies Sydney Hotel 14 Carrington Street, ☎+61 2 9299 1000 (fax +61 2 9290 3819) . Good value inner city hotel overlooking Wynyard Park. An easy stroll to Sydney Opera House, Circular Quay ferries and The Rocks tourist precinct. Rooms cost approx $175-$300 a night. Park Regis City Centre 27 Park Street, ☎1800 221 138. . Park Regis City Centre is perfectly located in the very heart of the Sydney CBD, adjacent to Darling Harbour and Hyde Park, the hotel is literally surrounded by Sydney’s best shopping, entertainment and sightseeing. Views from the 45th floor rooftop pool and observation deck are guaranteed to leave a lasting impression. Rooms from $132. Oaks Hyde Park Plaza 38 College Street, ☎+61 7 3246 1731. . The location of this hotel in CBD makes it a convenient hotel accommodation for business and leisure travelers. Facilities include roof-top swimming pool, fully equipped gymnasium ,spa or sauna. Oaks On Castlereagh 317 Castlereagh Street, Haymarket, ☎+61 7 3246 1746. . Located in Sydney CBD, this hotel provides serviced apartments with various facilities including heated pool, spa, gymnasium and barbeque, and complimentary Wi-Fi for the travelers looking for city hotel accommodation. Four Seasons Sydney, 199 George Street, ☎+61 2 9238 0000 . Located at the west edge of Circular Quay, the Four Seasons is an older but immaculately maintained five-star hotel with superlative service. Regular rooms are small, but have direct views of the Opera House, and it doesn't get much better than this locationwise. From $300 up, keep an eye out for promotional package deals. Intercontinental Sydney 117 Macquarie Street, ☎+61 2 9253 9000 (fax +61 2 9240 1240, email mailto:[email protected]) . Close to Circular Quay and the Royal Botanic Gardens. Jamison Sydney, 11 Jamison Street ☎1300 857 922 . Jamison Sydney is in the north of the CBD, close to The Rocks, Circular Quay, the Opera House and the Sydney Harbour Bridge. Rooms from $200-$250. Marriott Hotel, 36 College Street, ☎+61 2 9361 8400 . Sydney Marriott is a luxurious hotel, filled with everything that can be expected from a hotel of its kind. The hotel includes renowned cuisine, various bars, 2 pools among many other features. The hotel also enjoys one of the best locations in Sydney. Approx $265-$405 per night. Sheraton on the Park 161 Elizabeth Street, ☎+ 61 2 9286 6000 (fax +61 2 9286 6686, email mailto:[email protected]) . The Sheraton on the Park is one of the nicest 5 star hotels in Sydney. It is located opposite the Hyde Park (ask for a Park view room to take full advantage of the location, but note these are usually more expensive than the City view rooms) and the staff are really friendly. Rooms with one king sized bed: approximately $260 - $300 per night. The Westin, No.1 Martin Place, ☎+61 2 8223 1111 . Approx $325-$435. Superb rooms, particularly the Heritage rooms. In the daytime Sydney City is a busy location with high pedestrian activity. The biggest threat to your safety during the day is traffic, so take care when crossing roads with high traffic volumes and one-way flows. If you're out late, stick to popular areas and main streets. The main business area of skyscrapers and office building area north of Park and south of Bridge St becomes very quiet at night as the office workers return to the suburbs. Late at night anti-social behaviour and even some alcohol-related violence is possible around the George St Cinema strip (between Bathurst and Liverpool) and the northern (harbour) end of George St towards the rocks (north of Bridge St). The harbour end of George St is very busy on Friday and Saturday nights, with large numbers of people arriving in the city to go to the nightclubs, many of them already having started drinking hours ago. On other nights the area around the Quay down to the Opera House is very pleasant. It has a variety of restaurants and bars, a great view, and is safe. On the CityRail network at night stay close to the guard's compartment which has an exterior blue light, in the 4th carriage of the train. There is an emergency assistance button on every platform and by the entrance to the train carriages on more modern trains. You won't have any problem finding an Internet terminal in the City Centre, although they are perhaps not as common or cheap here as they are in the city south. Many convenience stores have a terminal or two. Expect to pay around $2.50 per 10 min. Customs house library at Circular Quay has cheaper access, but restricts access to email. Paid Wi-Fi is available at many coffee shops, or adjacent to public phones. Try Clarence St for a nice, alfresco selection of cafes. For free Wi-Fi go to McDonalds, the State Library (free password at the circulation desk), Customs House Library or Circular Quay Station. 3G Internet is available everywhere. Public Phones are common - you can also use them to send text messages, domestically or internationally. Take a ferry trip from Circular Quay to the Harbour Islands, Manly or Parramatta. Walk, or catch the train, over the harbour bridge to the Lower North Shore. This page was last edited on 4 May 2017, at 03:48.